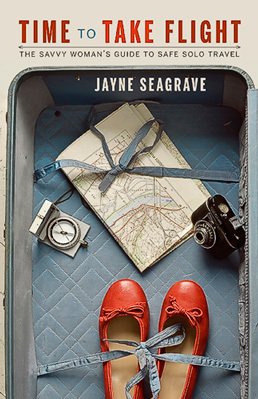 Chicago, St. Louis, London, Vienna ... bestselling author and entrepreneur Jayne Seagrave has traveled there, and she's done it solo. Based on first-hand experience, Seagrave has compiled easy-to-understand information and sound advice for women in mid-life who are eager but apprehensive to take a solo adventure. Travel doesn't have to be scary or difficult for the mature single woman. Confidence and planning are the keys. Time to Take Flight lays out the benefits of solo travel and refutes all the excuses that can be leveled against it. Seagrave writes like a worldly, well informed best-friend and shares advice for researching destinations, booking transportation and accommodation, as well as packing checklists. She also discusses medical insurance, ways to combat jet lag, and financial considerations, all of which is useful advice no matter your destination. Time to Take Flight is unapologetically for women between the ages of forty-five and sixty-five. Seagrave offers her readers encouragement, advice and support so they can fulfil their wanderlust while staying safe and comfortable. Her aim is not to replicate the information available in existing guidebooks, but rather to supplement it with advice that is customized for, and addresses the concerns of, the solo mature female traveler. For the savvy woman looking to travel safely, comfortably, and on their own. Time to Take Flight is the ultimate guide. Paperback and Kindle Editions available! Excerpts from Time To Take Flight can be read here.